As he always insisted, he did not legislate any of the laws that govern the universe and he did not invent a secret new way by which mankind can partake of the unlimited good in the universe. He sought only to explain the infallibility of the laws and express the essence of the ever existent way. No one before him had done that. His work was to make this modest man “a man for the ages” a pioneering guide to all humankind. His name was Ernest Holmes. He was born January 21, 1887, on a small farm near Lincoln, Maine. His parents, William and Anna Heath Holmes, had nine sons. The youngest was named after a poetic young preacher of that area, Rev. Ernest Shurtleff, who later wrote the hymn, “Lead On, O King Eternal.” In the order of their arrival, Ernest Holmes’ older brothers were: Walter, Luther, William, Charles, Harry (who died in infancy), Fenwicke, Guy and Jerome. He acquired “the basics” of education in rural schools, grammar school in Lincoln and Gould’s Academy in Bethel, Maine. He once said, “I quit school when I was about 15 and didn’t go back except to study public speaking.” From 1908 to 1910, working in a store to pay his way, he attended the Leland Powers School of Expression in Boston. The rest of his prodigious learning came from an insatiable search for what would be most meaningful for any man to know. He was an omnivorous student of and finally an authority on the universal truths and imperishable ideas manifested through the ages in literature, art, science, philosophy and religion. He spent a lifetime synthesizing his discoveries. The result, The Science of Mind. 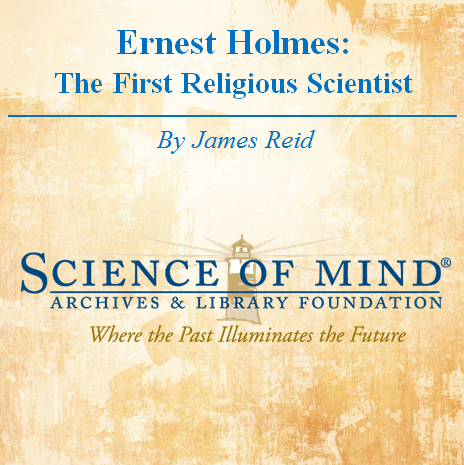 Near the close of his life, he talked to an interviewer about his own beginnings and the beginnings of Religious Science.